In a banner year of three new works from the Dallas Opera, the company this week launched a different kind of premiere: a week-long Institute for Women Conductors. This school may be the only one of its kind in the world. Jessica Gethin conducts the end of a musical passage by Verdi. At the piano are two opera conductors, including another Institute Fellow. The Dallas Opera’s music director, Emmanuel Villaume, is giving this master class. 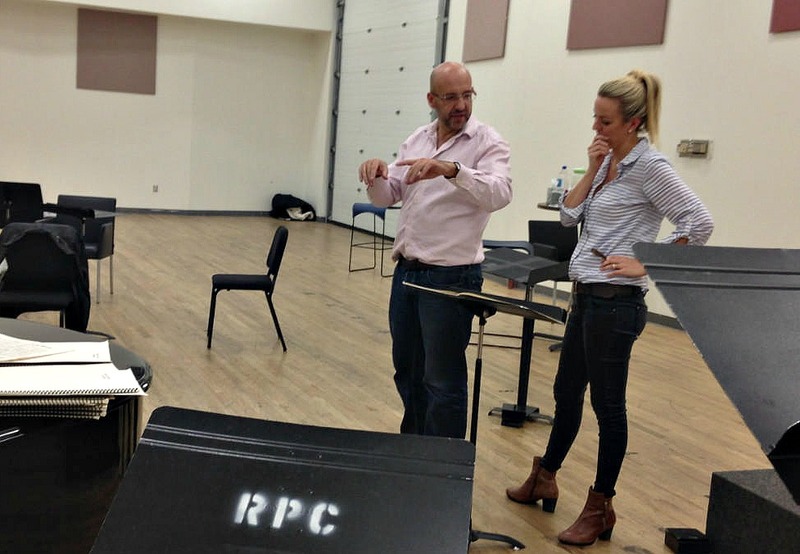 Gethin is one of six fellows in the Dallas Opera’s inaugural Institute for Women Conductors. She’s already an accomplished professional, having led Western Australia’s Perth Symphony since 2011. Now, the married mother of two wants to tackle opera and sees advantages to this female-only institute. Other fellows see that and more. Russian-born, Moscow-trained pianist Anna Skryleva has built a music career in Germany for the last 16 years. She’s a conductor there now. Through some of those years, she played piano during opera rehearsals and played here, when Institute Fellow Gethin was conducting. This week, Skryleva’s also learning about yet another side of opera – management. “In Europe, nobody teaches us about how does it work to lead a company? And I’m sure, to be a conductor, if you are trying to get in a position of music director, and this is also my dream, you need to know the business, yes, how to manage,” Skryleva says. 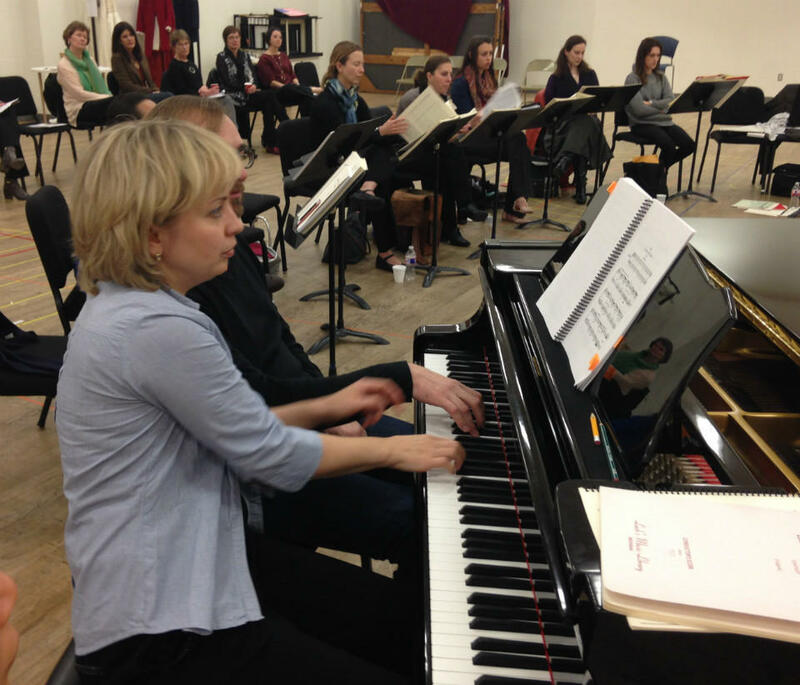 Anna Skryleva’s at the piano taking direction from fellow Fellow Jessica Gethin. Before Skryleva became a conductor in Germany, she was a pianist for opera rehearsals. Dallas Opera CEO Keith Cerny noticed for years a lack of women conductors or or managers. He launched this institute to deepen the pool. In the Institute’s case, that search led to 106 applicants from 26 countries. Based mostly on resumes and some videos, Cerny, Villaume and the Dallas Opera’s principal guest conductor, Nicole Paiement, chose the six fellows and four observers, all of whom are professional musicians. Paiement wishes this kind of institute existed in her early years. Another big help this week, says Villaume? The Fellows are conducting professional musicians including singers and an orchestra. That concert caps off the week’s sessions Saturday. Next year’s Institute, says Cerny, will last two weeks with a professional orchestra. Female conductors have to be able to relinquish their femininity in order to conduct effectively. Their hair has to be tightly restricted, as in a bun, or pinned down, or kept fairly short so as not to be a distraction, with excessive movement. They cannot wear jewelry or perfumes, or low-cut necklines, etc. These are all distractions. Moreover, they are about superficial appearances, which serious conducting is not about. They must have the same force and command as a man. As a musician, I have to either ignore the conductor and play as I see fit, or honestly respond to what the conductor is doing. I cannot follow a decoratively dressed person with a weak or flouncy beat, as I have seen in some women conducting. If they refuse to deal with these issues and hide behind gender politics, there is no way they should be conducting. Men have to eschew all those things already. Who actually likes to wear a tuxedo? They’re restrictive and servile.